Modern conservatism has generally encompassed multiple forms. Over the last half of the 20th century, each decade has contained at least two identifiable strains of conservatism. The 1950's saw the onset of modern conservatism, beginning with William F. Buckley's intellectual National Review, which established conservatism as a force against communism and its milder American counterpart, the New Deal. It was an international conservatism, unlike the establishment conservatism of the time, which was isolationist. In the 1960's, conservatives divided over civil rights. A minority of conservatives rallied around the states' rights position espoused by Barry Goldwater, particularly southerners motivated by their opposition to the civil rights movement. Their counterparts supported the Civil Rights Act, although they did not agree with other parts of the civil rights movement. Neoconservatism emerged in the 1970s, as a reaction to the radical leftist agenda of the 1960's. Neoconservatives were more interested in challenging the hippies and activists than dismantling the entrenched programs of the New Deal. Its conservative counterparts in the 1970's were the John Birchers and Young Americans for Freedom, who refused to budge an inch in support of any program of the left, and who preferred Barry Goldwater or John Ashbrook for President over President Nixon. 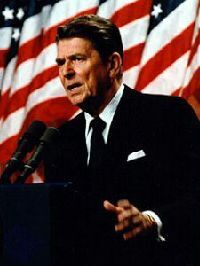 In the 1980's, President Reagan successfully brought together social conservatives and business conservatives to form his base in the Republican party. By the 1990's, those conservatives had merged to some extent, many of them becoming Rush Limbaugh conservatives who supported both the economic and social agenda of the Republican revolution in 1994. Frustrated by the compromising of the new Republican leaders, particularly the capitulation of Newt Gingrich, a drift to the libertarian right emerged, which had already begun with the founding of the Republican Liberty Caucus in 1990. As the first decade of the 2000's progresses, it is becoming increasingly clear that the two types of conservatism that will define this decade are neoconservatism and paleoconservatism. The war in Iraq has brought out a deep division between the two philosophies, exemplified by paleoconservatism opposition to the conservative Bush administration's intervention into Iraq. Paleoconservatism is defined in the American Heritage Dictionary as, "extremely stubborn or stubbornly conservative in politics." The term paleoconservative actually originated fairly recently, in the Rockford Institute's Chronicles magazine, as a reaction to what was seen as increasing neocon encroachment into conservatism. Palecons claim that their brand of conservatism is the true descendant of conservative thought of the 1950's and 1960's. Paleocons prefer an isolationist foreign policy, and accuse neocons of being interventionist and soft on big government programs. Neoconservative is defined as an intellectual and political movement in favor of political, economic, and social conservatism that arose in opposition to the liberalism of the 1960's. Paleocons tend to believe that most conservatives today and over the past couple of decades are neocons. What may really be the primary and underlying source of division between the two philosophies is their approach towards Israel. Since Israel was established in 1948, U.S. policy has generally been one of preserving Israel's stability in the Middle East. Most conservatives have historically aligned themselves with this position for varying reasons. Some saw the state as compensation for the displaced Jews after their slaughter in the Nazi holocaust. Others saw it as a bastion of democracy to be supported amongst the Arab authoritarian regimes as a check on their spread and power. Many Christians supported the existence of a strong Jewish state because of their close relationship with the Jewish people theologically as the chosen people, their reverence for the Jews as the inhabitants of the Holy Land in Biblical times, and Biblical prediction that the Jewish people will eventually return to the Holy Land. Yet, ironically, it is now primarily Christian conservatives who make up the paleocons opposing aid to Israel. Instead of seeing Jews as fellow kindred, these Christians see Jews as hostile to Christianity, and therefore are less inclined to support Israel. Instead of welcoming Jews – who have generally been considered solidly liberal - into the Republican party, many paleocons are suspicious of their intentions. Paleocons accuse the Republican party of being overrun by neocons, and many paleocons believe that Jewish conservatives are behind this. The accusations have gotten quite touchy, with many paleocons accusing Jewish conservatives of using anti-Semitic accusations to bully their way around and push their own agenda. Of course, when paleocon Pat Buchanan throws around phrases like, "Congress is Israeli-controlled territory," there is an argument that can be made that a remark like that could be construed as anti-Semitic. Many anti-Israel paleocons are using the Iraq war as an opportunity to speak out not just against the war, but to accuse conservatives and President Bush of supporting the war because the neocons, who they claim are dominated by Jews, are in favor of it. However, this argument is flawed in several aspects. First and most obvious, not only neocons supported the war. Most conservatives supported the war, some even more adamantly than the neocons, such as military, law enforcement, and certain social conservatives. Secondly, most conservatives are not "neocons," unless the term is broadly defined to include any conservative who is not anti-interventionist, which is how some paleocons seem to be defining it. The standard definition of neocon only encompasses a small percentage of conservatives; most conservatives did not become conservative only in reaction to the 1960's, and most still resent big government; they would be quite happy if welfare completely disappeared. Paleocons tend to overemphasize neocon approval of the welfare state. In reality, it would probably be more accurate to say that conservative politicians support a welfare state, whereas common conservatives are less likely to support it. Thirdly, the number of conservative Jews is still small. Only 20 per cent of American Jews voted for President Bush, actually down from the 35 per cent who voted for Reagan in 1988, and only 8 per cent of Jews consider themselves "conservative," as opposed to 26 per cent of non-Jews. And although there are a handful of well-known Jewish conservatives, their presence is slight compared to the numbers of non-Jewish conservative leaders. None of the Bush administration's cabinet-level appointees are Jewish. What is interesting about this latest split between conservatives is that no longer is the debate between the "moderates" and "right wingers" like it has been frequently in the past. Now it is primarily an ethnic debate, focusing on U.S. attitudes towards ethnic and racial groups within and outside of the U.S. And instead of being sidelined to the pages of history books, Pat Buchanan, former Presidential candidate and leader of the social conservative isolationist right, is leading the paleocons in this attack on what they see as the neocon takeover of conservatism. Buchanan's new magazine, The American Conservative, claims that conservative organizations such as the Heritage Foundation, the American Enterprise Institute, and the magazine National Review, have been taken over by neocons. However, paleocon views have become more popular since 9/11, since Americans are much more fearful of terrorists entering the country, and so are more willing to tighten down on immigration laws and the borders. Furthermore, the paleocons are not completely marginalized, they count among their numbers several respected intellectual heavyweights, including the Rockford Institute, LewRockwell.com, and to some degree, the paleolibertarian Ludwig von Mises Institute. The future of conservatism depends on how these two factions cooperate. Unlike past divisions between conservatives, this division will only increase, because the ethnic diversity within the U.S. keeps increasing, and Israel's stability in the Middle East keeps declining. What most conservatives do not realize, and are not prepared to address, is that ethnic-related issues are going to be the crucial problem facing them this decade. At the present moment, conservatism appears unified, because the paleocons were not able to thwart the intervention into Iraq, probably because their numbers are still too few. After all, according to a recent ABC news poll, an overwhelming 81 per cent of Americans believe it was right to go to war with Iraq, and 60 per cent believe that it was right even if no weapons of mass destruction are ever found. But resentment is building, and as long as the paleocons are convinced that conservatism has been hijacked, they will not stop their assault. Rachel Alexander is an attorney practicing commercial and administrative law in Phoenix, Arizona. She is the editor of IntellectualConservative.com, and writes articles for various e-zines.